One of the frequent mistakes I see when working with clients is that they don’t gauge their personal performance with the proper benchmark. I have people who have an intermediate portfolio with 50% bonds upset because they are lagging the S&P 500 by a couple percent, while others are invested heavily in international stocks, yet compare their performance to a domestic small-cap index. It can be confusing with so many different benchmarks, and the likelihood of your portfolio not quite matching up exactly with some of them. But, if you aren’t comparing the numbers to the right benchmark, they are worthless. Before you can even consider picking a benchmark, you need to actually understand what you’re really invested in. Unless you just own one index fund, you probably have a relatively complex mix of large and small-cap, international and domestic companies, bonds, cash, or maybe even other specialty investments. Once you know the breakdown of your portfolio, you can then begin to look for the appropriate benchmark to measure it against. The best way to do this is to use the free Portfolio Manager tool at Morningstar. Registration is free, and this login will allow you to access many other free tools available throughout the site. 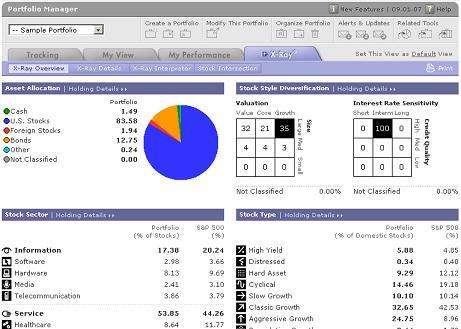 With portfolio manager you can track and analyze your portfolio, using unique Morningstar features such as Portfolio X-Ray, Interpreter, and Stock Intersection. One of the most handy tools is the X-Ray tool. This will show you a detailed breakdown of your portfolio from asset class, credit quality and maturity, market sector, and even compare holdings to the S&P 500. This is where you really begin to understand what your portfolio is made out of. In this example, we can see that this portfolio is heavy on large-cap stocks across all three areas from value to growth, and contains around 14% of holdings in bonds and cash. Clearly, this portfolio isn’t 100% equity, and the allocation of holdings does not match the S&P 500 exactly, so that would not be an appropriate benchmark. Now that you understand how your portfolio is structured, you can find a benchmark that is more closely aligned with your true holdings. 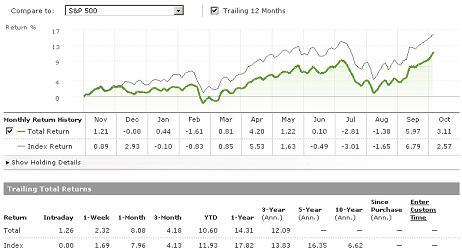 Morningstar provides yet another tool within the portfolio tracker to provide a quick estimate as to how well your portfolio is doing with the Performance tab. 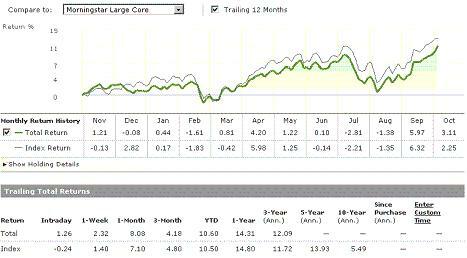 Once you select that tab, you can see how your returns matched up against various benchmarks of your choice. Obviously, this doesn’t take into account multiple purchases over time through dollar cost averaging or any withdrawals, but it shows you what that particular portfolio would have done over the specified time frame. Clearly, your portfolio is not performing as well as the S&P 500, and it shouldn’t. Remember, you are holding various investments, some of which have more of a growth component, not to mention close to 14% in fixed income. So the question shouldn’t be concerned with the under performance, but whether or not that performance is appropriate for your investment mix. As you can see, the performance gap against this benchmark is a bit closer than to the S&P. Again, this isn’t a completely accurate representation since the actual portfolio does hold bonds, but the YTD, 1-Year and 3-Year returns are generally insignificant, often under 0.5%. This is actually quite good for essentially an 85/15 mix of stocks and bonds. There will never be a perfect way to measure performance once your portfolio begins to get complex, but comparing it to the most appropriate benchmark will give you a much better idea of how it is actually doing. You could be beating the S&P by 10%, but if you are invested in a few specific sector funds, that doesn’t mean anything. Maybe you’re beating the S&P, but you might be in some of the worst performing funds of that particular sector and not doing as well as you should. Just the same, you might have 50% of your portfolio in bonds, yet only lag the S&P by a couple points. That would be fantastic if you could do that well with such a high percentage of fixed income in your portfolio. So, it all comes down to what you’re comparing your returns to, and before you make any drastic changes to your investments based on performance, make sure you are comparing to the right benchmark. You may think that the 5% return you’re earning every year stinks, but if you examine your portfolio closely, it may be doing exactly what it should be based on how it is constructed. These investors are taking pretty much for granted the fact that their investment portfolios had more than merely survived the most severe correction in financial market history. They had recouped all of their market value, and maintained their cash flow to boot. Good to see a nice, thorough article on Morningstar. I have been using them for over two years now and it is certainly a good tool to have. This definitely appeals to the visual side of me... give me some graphs and a pie-chart and I'm sold! Love the x-ray tool - I hope that your getting comissions from the amount of sign ups you get!! Good article. I will have to try out the X-Ray tool. Excellent article. Thanks for doing this piece. What would be a good way to select the appropriate benchmark? Would a weighted average mix of indexes be the appropriate benchmark to measure against? I'm sold :) Great review of what you can do with this. I'm going to sign up right now! Agreed!! LOVE the xray tool. It's strange to see how the different still can fall into similar categories... nice post.